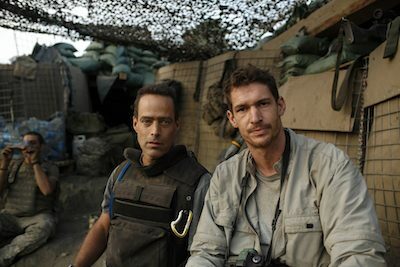 Restrepo film directors Sebastian Junger (left) and Tim Hetherington (right) at the Restrepo outpost in the Korengal Valley, Afghanistan. Restrepo, an award-winning documentary film about the US Army Second Platoon’s deployment to the Korengal Valley – widely considered the most dangerous locale in Afghanistan – is screening at the Bermuda Documentary Film Festival on Friday October 22. The film won the Grand Jury Prize at this year’s Sundance Film Festival. Directors Tim Hetherington and Sebastian Junger were embedded with the platoon for large parts of the soldiers’ stay in Afghanistan. Q: How did you come across this particular assignment – what brought you there? Why did it appeal to you? Sebastian: We were on assignment for Vanity Fair and ABC News. After an embed with Battle Company in 2005, I’d had the idea of following one platoon for an entire deployment and both writing a book and making a documentary about their experience. Q: We hear the initial reactions of the soldiers upon hearing that they’ve been assigned to the Korengal Valley. What was your initial reaction? Sebastian: When I stepped off the helicopter in June ’07 I was stunned by the ruggedness of the terrain – and the beauty. Then again, I didn’t have to spend a year there, and I assumed the fighting would be minimal, which of course it wasn’t.